Marie (DeMartis) Samuelson, age 87, beloved wife of the late Frank Samuelson, Sr. entered peaceful rest on Thursday, December 28, 2017 in Providence, RI. Born in Corona, Queens, NY on March 17, 1930, she was a daughter of the late Domenick and Mary (Petrelli) DeMartis. 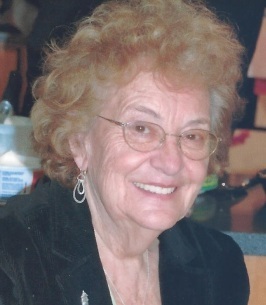 A longtime resident of Oxford and Southbury, Mrs. Samuelson was a retired benefits representative for the Social Security Administration in Ansonia where she took great pride and satisfaction helping individuals in their later years. She enjoyed reading and classic movies, but above all else, faith and family were the most important things in her life. Marie will be deeply missed by those who loved her. Survivors include her beloved children, Marianne Alger and her husband David of Cumberland, RI, Frank Samuelson Jr. and his wife Lynn of Southbury, Dr. Robert Samuelson and his wife Karen of Tucson, AZ, William Samuelson and his wife Kathleen of Cheshire, and Thomas Samuelson of Marblehead, MA, and ; brother, Joseph DeMartis and his wife Linda of LI, NY; sister, Helen Mele and her husband Alfonso of Sierra Vista, AZ; 12 adored grandchildren, David, Meagan, Elizabeth, Brian, Todd, Lauren, Eric, Ann, Dean, Clare, Kristen and Matthew; 7 cherished great grandchildren, as well as many loved nieces and nephews, and a few close dear friends. She was predeceased by her siblings, Felix, Michael, James and Frances DeMartis. A Memorial Service celebrating her life will take place on Saturday, January 27, 2018 at 11 a.m. in Sacred Heart Church 910 Main St. South, Southbury, CT 06488. Friends are invited to greet the family from 10 a.m. until the time of service in the church. Interment will be held at the convenience of the family. In lieu of flowers, please consider donations in Marie’s memory to Children of the Light (heart4children.com) PO Box 46, Tomball, TX 77377, or a charity of your choice. The Ralph Hull Funeral Home, 161 West Church St. Seymour, CT 06483 has been entrusted with her arrangements. To send flowers to the family of Marie Samuelson (DeMartis), please visit our Heartfelt Sympathies Store. Our thoughts are with you and your family. With our deepest sympathy.